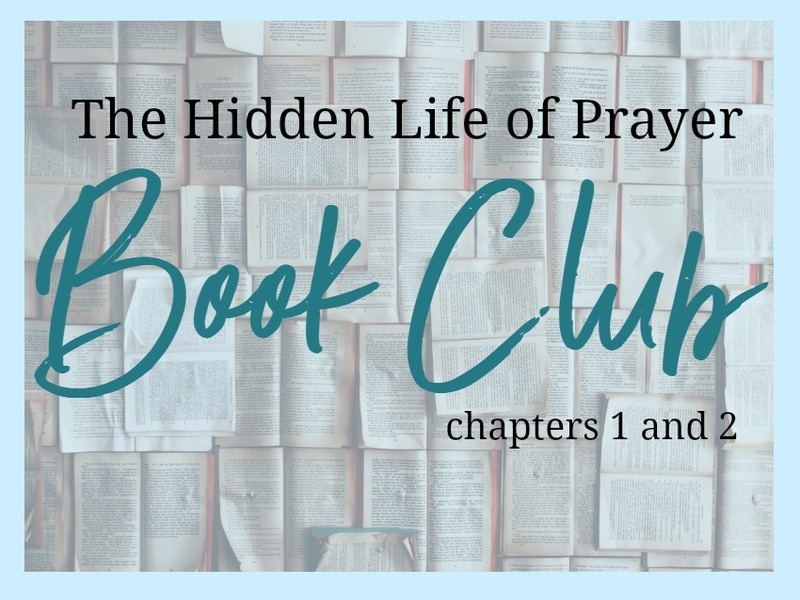 It's week one of our first ever book club! Grab yourself a cup of coffee or tea and a notebook to jot some notes, and a copy of your book! There's a big part of me that wants to be in a real, physical meet together book club. But there's a bigger part that says "Nah, you're good. Stay home and read. Alone." I usually listen to the bigger part of me. But, that's why I'm so excited about our online book club because it just might be the best of both worlds! For the month of February we're reading through The Hidden Life of Prayer by David McIntyre. David was a Scottish preacher who lived from 1859-1938 and wrote this little but powerful book in 1906. For this first week, we read chapters one and two. I don't know about you, but I had a bunch of highlights and underlined passages! I loved that right on the first page, he admitted that prayer is hard work, a laborious undertaking, but that it is the most sublime energy of which the spirit of man is capable. Why is it such hard work? McIntyre gives us a couple of reasons: We are spiritually hindered and we have an enemy who hates prayer. He also says sometimes we are led into dry wilderness experiences, sometimes we seem to be given over to disorder and unrest, and sometimes it is our own inbred slothfulness that can turn our minds from the exercise of prayer. What do we do about it? He gives us a simple but hard answer: be diligent and resolved, watching as a guard who knows that lives are depending on his wakefulness, resourcefulness, and courage. "[Prayer] is in one aspect glory and blessedness; in another, it is toil and travail, battle and agony. Uplifted hands grow tremulous long before the field is won..."
1. Write a simple outline of the chapter with the title and each subheading in a journal or notebook. 2. Toward the end of the section titled "Prayer is Hard Work," the author lists six verses at the end of the third paragraph (Psalm 119:25, 40, 88, 156; Ps 143:11; Isa 64:7). He quoted part of these above the references. Look up and write out each verse in your journal. 3. Under the section "Pray on All Occassions," at the end of the second paragraph there is a covenant from Sir Thomas Browne, rewrite that covenant for your own life. 4. After writing that covenant out, underline one part of it that you could work on starting today. How will you do it? How will you remember and build it into a habit? I loved that this chapter was practically helpful in showing the three things needed for prayer: A Quiet Place, A Quiet Hour, and A Quiet Heart. And he didn't cut any of us any slack who have busy lives or a full home. At the end of the section "A Quiet Hour," he quotes Susannah Wesley and how she made a sanctuary in the simplest way by throwing her apron over her head. The most underlined part in this chapter for me, was the Quiet Hour. "Certainly, if we are to have a quiet hour set down in the midst of a hurry of duties, and kept sacred, we must exercise both forethought and self denial. We must be prepared to forgo many things that are pleasant, and some things that are profitable." Ouch. "We shall have to redeem the time, it may be from recreation or from social interaction, or from study, or from works of benevolence, if we are to find leisure daily to enter into our closet, and having shut the door, to pray to our Father who is in secret." "Let no man that can find time to bestow upon his vanities...say he [can't find time] for praying" (quote from the footnotes). Let me know what stood out to you, what you thought, any things you are going to try, etc. in the comments! So appreciate your comments Kari! Thank you so much for starting this online book club - I don't think I ever would have picked up the book without your challenge but I'm really enjoying digging into it! So glad you are! It's a great gem of a book! I just loved the first 2 chapters of this book. I downloaded the free on-line version but I want to get the real book I can hold in my hands and highlight. This is so good. Thank you so much for this book club and choosing this book as the first one. I loved the same quotes you do and want to go deeper in the chapters in a journal book just for this. Thanks again and be blessed. I know what you mean about wanting a paper copy! This one almost demands that. I'm sure I'll be re-reading it! So glad you are joining us in reading together! I have been LOVING this book and even got my husband started reading it. I haven't even finished up Chapter 1 yet because it's so good and I'm really taking my time with it. I was especially convicted by Augustine's quote that defined prayer as an expression of love and Bunyan's quote: "If thou art not a praying person, thou art not a Christian." Ouch! Do I know what it is to wrestle in prayer? Only in my most difficult life challenges have I come even remotely close to the feelings expressed by Brainerd and Tersteegen. So, so much more good stuff, but don't want to write a novel here! :) Also, I found a study guide to go along with the book at the mountzion.org website if anyone else is interested in that. Oh, I SO agree with your words on wrestling in prayer. I'm right there with you! Thanks for the info about the study guide too. I looked it up! Wow there was a lot in these two chapters. I particularly liked the part about needing quiet space, quiet time, and a quiet heart. The quote about giving up even what is profitable to get time for prayer really hit me also. oh, yes. Giving up even what is profitable. I felt that one too. Still thinking through all of those three things! I had also highlighted both quotes in Chapter One and might add, “We do not know the true potency of prayer until our hearts are so steadfastly inclined to God that our thoughts turn to Him, as by a Divine instinct, whenever they are set free from the consideration of earthly things.” and, also, “Soldier of Christ, you are in an enemy’s country; “Keep to the Lord’s watch.””. My action item in the necessity of A Quiet Heart is not to be impatient and rather to continue to read the passage or verse until I feel the nudge and hear the voice of God speak to me. I love your action item of not to be impatient! So good! First of all thank you for devoting your time to this book club. I pray that you will be blessed as much as we have been by undertaking this journey. What stood out to me was that prayer is hard work and I tend to shy away from hard things in this season of my life. These 2 chapters helped me see what pray continually means and how to pray without ceasing is. I am really enjoying interacting with everyone and reading your thoughts, so it's a huge blessing! Ya, I love/hated those sentences about it being hard work. I was talking to my friend just today, in fact, about that section and how what she and I tend to do is think that those short little in-the-moment prayers are all our prayer life is meant to be. But those aren't hard work. Those are quick and easy. Wrestling and laboring in prayer is something I tend to shy away from too. But I'm encouraged to know that it has been hard for everyone, even amazing people hundreds of years ago. So that gives me courage to stick to it! It truly is humbling to know that something so simple and free could be and is very hard work. My favorite eye opener was in chapter 2. It explained the difference between secret chamber prayers and continual prayers. I realized that I tend to be a continual prayer person and my chamber prayer time, while I do this, is not as consistent as it ought to be. The most humbling of all was the short comment on how Christ Jesus' prayers were strenuous and warlike. Why so humbling? Because it reminded me of how much I fail in my daily life, but that Christ is still showing me how to be completely reliant upon Him...even in my prayers. The other insight that I was reminded of was that there is always a way to accomplish anything (even finding a quiet place to pray despite your surroundings) if you have a mind, heart, and God-given will to do it. Prayer is such a special gift from God and I hope I never take for granted this simple, yet very powerful gift He has given me through the blood of Christ Jesus. Yes, YES, YES! I'm right there with you. Humbling to know what I have been doing hasn't even scratched the surface of struggling and laboring in prayer and how important it is to do it, regardless of my excuses of not having a quiet hour, a quiet place, or a quiet heart. Wonderful thoughts! Love this! I will be instituting my weekends to staying up later so I can still have my alone time in Gods word and with my new prayer binder, as usually weekends have full house and many grandkids and before was very hard to make time in mornings as I do during week. YAY! I love practical, real life, plans! Go Lisa!! I just received the book this afternoon and was able to read the first chapter. I will be better prepared next time. I need to go back over the chapter and do some underlining and the journaling you suggested. I feel that evenings will be a better time for me to spend in prayer and meditation. I also loved the part of the book that you wrote about. Keeping a continual prayer going in my heart keeps my thoughts where they need to be. And I loved the part about the prayer that has no words--the one that only my Savior and I can understand because He knows what is in my heart. So glad you got it and are joining us! I have just completed the first two chapters and also have many highlights and underlining AND double underlining! The first chapter brought a lot of conviction most of which came from two quotes. 1) 'He that loveth little prayeth little, and he that loveth much prayeth much.' 2) Soldier of Christ, you are in an enemy's country; 'Keep to the Lord's watch.' Retirement which should bring more time to spend with God in prayer and Bible reading has seemed to make me more lazy in these areas. My first plan of action: Ask for a fresh gift of the Holy Spirit to quicken my sluggish heart, and a new disclosure of the charity of God. I thank God for bringing this study to my attention and for His great mercy and His grace. Yes! Those are amazing quotes! Especially "keep to the Lord's watch!" I'm not retired, but my boys are older and only one is left at home, and I am often convicted that earlier during their younger years, I always thought that if I had a moment's peace and quiet I'd pray and read my Bible more. Well, now I have a lot more quiet and don't take advantage of it nearly enough. Sluggish heart indeed! So true! Thank you so much for your suggestion to outline the chapters. My book doesn't have headings, so I get to come up with them on my own. Arguably the most significant new Logos 8 feature is the Notes tool, so I am putting my outlines and thoughts in there. This makes them searchable and easily accessed during Bible study.